Massop Electric, Inc. is a dealer for Behlen Mfg. Co., Meridian Mfg Group (formerly Friesen of Iowa Inc.), MFS York Stormor and Schuld. 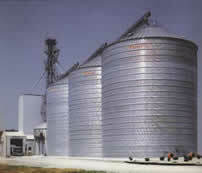 We will help match your specific requirements to the type of grain storage that best meets those needs. Behlen Grain Commercial Storage Tanks - Six diameters are offered from 16' to 105'...eave height to 85' and capacities up to 1,000,000 bushels. Behlen offers one of strongest roof systems on the market, the roof panels are 3 ½" high with double stair steps on both sides. The panels are fabricated out of high-quality, mill galvanized steel with tensile strength up to 65000 PSI. Behlen Commercial Hopper Tanks - These hopper tanks have the capacity from 3120 to 34408 bushels. MFS Large Capacity Stroage Bins - These storage bins are available in capacities up to 472,000 bushels and diameters up to 90 feet. Meridian Mfg Group - This design is completely self-cleaning with no edges or obstructions; no shoveling is necessary with a Meridian bin. These hopper bottom bins are available with aeration equipment and can be used as wet holding and a cool down bin after your grain dryer. These tanks can be used for: feed storage, fertilizer storage, herbicide bins, plastics storage, cement silos, or convert your flat bottom corrugated bins to a hopper bottom bin, using their hopper bottom cone. Schuld Tanks – Offers galvanized all welded hopper tanks, for feed or grain. Massop Electric Inc. is a factory distributor/dealer for Hutchinson Mayrath augers. We have new, used and a large line of repair parts in stock. Mayrath Swing Away Augers - This auger was designed with easy maneuverability and easy operation in tight spaces. The hydraulic lift on the undercarriage makes easy work out of raising, lowering, and positioning of the auger. The Swing Away Flex Hopper will allow the hopper to be almost horizontal no matter what the operating angle. Mayrath TD Auger - This auger offers a range of lengths in painted or galvanized pipe. The undercarriage has nylon rollers for smooth operation and reduced in-winch strain. With its wide wheelbase and scissor under-carriage, it means stability during operation or while being lowered. Mayrath TD Plus Auger - This galvanized auger line has many option choices. Corn screens are available on 8" and 10" models. Internal bearings on 6", 8" and 10" models. Heavy gauge flight on 6", 8" and 10" models. Hydraulic or electric winch options are also available. Hutchinson Mass-ter Mover - This square paddle propulsion uses less horsepower than a screw conveyor. This component system adapts to many uses: drive-over pit, horizontal or inclined storage loading, bottom unloading, filling or taking away from a dryer. This power head may be used horizontally or in conjunction with various elbows for inclined or vertical discharge. With capacities from 2500 to 8500 bushels per hour. Single horizontal lengths to 200 feet. Hutchinson Mass-ter Flow Drag Conveyor - This shallow paddled unit runs in a single chamber conveyor which provides deep layer, high volume grain movement. These conveyors are available as a stationary overhead or return and bottom unloading systems. Not recommended above a 4° incline. With capacities from 3300 to 15000 bushels per hour. Single runs to 240 feet.